The outstanding natural history and geology of this 617 hectare property are recognised by its designation as a National Scenic Area and Environmentally Sensitive Area. It also falls within a Site of Special Scientific Interest. Volcanic eruptions many millions of years ago formed the distinctive stepped outline of the peninsula, as the molten lava cooled to form the cliffs which can be seen today. The sea cliff beyond Burg Farm retains the impression of a tree, known as MacCulloch's Fossil Tree. This tree is over 12 metres high, 1.5 metres in diameter and was discovered by John MacCulloch in 1819. The Fossil Tree is a 14 mile linear walk, beginning at the Car Park beyond Tiroran. It is NOT possible to park at Tavool House. Due to the mileage and terrain (rocky coastal and narrow cliff paths) this is not a walk for the faint hearted and we always recommend you join a guided walk. Mull Magic conducts regular walks to the Fossil Tree - for further details please click here. 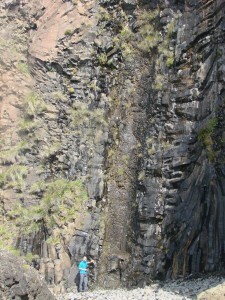 The walk involves a climb down a steep metal ladder which has been attached to the cliff face. Therefore the trip is not suitable for dogs or for anyone with a fear of heights or vertigo.